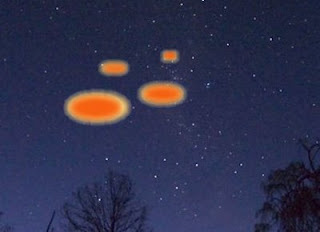 There have been numerous reports of Orange UFOs / Orbs seen over many places in the UK ... One of which is that of Ealing, London ... On the 24th of April 2010 at around 23:00 h these Orange UFOs were seen coming from the Southeast and moving in the Northwest direction.
" Out of the 6, I captured 5. The area is frequently flown by airplanes going to and from Heathrow but never through this route. the UFOs were also unusually low and appeared to travel much faster than a plane normally does. There was no sound and underneath we can see orange concentric circles. " I live in stoke on trent (middle of england) and i and many of my freinds have seen these dark orange UFOs. I have seen about 7 or 8 of them, they are silent, move left to right unlike a plane would move and dissapear almost instantly.